These herders, shown arriving in Egypt, are from a tomb painting. They could be Hebrew or Hyskos, but the beards, clothing, and livestock identify them as Semitic. 361 people in our community are currently praying with you. This catchy calypso song, based on Psalm 137, was a popular hit around 1980. Therefore they set taskmasters over them to afflict them with heavy burdens. They built for Pharaoh store cities, Pithom and Raamses. But the more they were oppressed, the more they multiplied and the more they spread abroad. And the Egyptians were in dread of the people of Israel. So they ruthlessly made the people of Israel work as slaves and made their lives bitter with hard service, in mortar and brick, and in all kinds of work in the field. In all their work they ruthlessly made them work as slaves. As history as shown time and time again, an insular ethnicity within a nation or society creates instability. Most often, they are gradually absorbed, but this was impossible with the Egyptians and the Hebrews, for both were strongly based in religions that excluded the other. To the Egyptians, herders of sheep and cattle were an abomination and the Egyptians would not even eat a meal with these unclean foreigners. For the Hebrews, at the time, the problem was more religious; their monotheistic God was a jealous god and the children of Abraham could not assimilate in a polytheistic and idolatrous culture. The Egyptians had good reason to dread the Hebrews. They had been conquered by a tribe of Semitic herders — the Hyskos — who ruled Egypt for centuries. 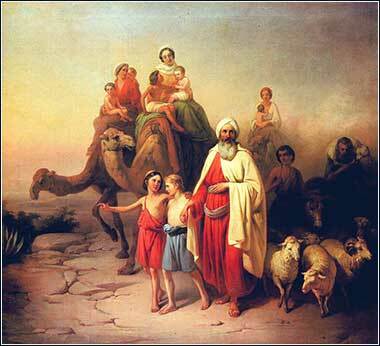 The Hyskos had just been expelled when Joseph first traveled to Egypt, so it was a fresh wound. And so it was that the Hebrews became a slave race for a period, similar to black Africans in America and the Arab world, or Koreans in Japan. The two cities mentioned here were prominent in history and known to the Greeks and Romans, but no longer exist. All of them were located in the eastern Nile delta, the home of the Hebrews. Pithom was the center of trade between the Red Sea and the Mediterranean, and Raamses was (ironically) the old capital of Hyskos. The Hebrew Bible, from which the Protestant Old Testament is generally taken, includes a third city in the list, Heliopolis, a very important city and the capital of Goshen itself (the name of the region where the Hebrews lived). It was located near present day Cairo and was destroyed primarily for materials to build Cairo. In fact, suburbs of Cairo are built on top of it. The famous London landmark called "Cleopatra's Needle" was looted during the cannibalization of Heliopolis.